I don't think that I am stepping too far out of line by suggesting that Nicolas Cage has had a somewhat spotty cinematic track record as of late—factor out the rare excellent films such as "Adaptation" and "Bad Lieutenant: Port of Call, New Orleans" and the occasional cult curiosity like "Knowing" or the wildly underrated and genuinely misunderstood remake of "The Wicker Man" and one is left with one chunk of junk after another that has seen him squander his considerable talents. Perhaps even Cage himself has begun to realize that something needed to change because his latest film, the powerful drama "Joe," could not be further removed from his recent string of failures and his work in it is one of the keys to its success. This is not just the best performance that he has given in ages—this is one of the very best performances of his long and strange career. Cage plays Joe Ransom, a man who we can see has had a dark and brutal past even before we learn any of the details. He drinks and gambles, keeps an exceptionally nasty bulldog as his only real companion and has a long-running feud with a local tough guy (Ronnie Gene Blevins) that grows more violent with each exchange. On the other hand, he is reasonably friendly and gregarious to those he trusts and inspires a lot of loyalty in return, especially in regards to the road crew of day laborers that he employs to poison trees on behalf of a local lumber company. One day, a new kid named Gary (Tye Sheridan) shows up looking for work and Joe is impressed with his strong work ethic. He begins to take Gary under his wing and soon discovers that he is squatting in an abandoned house with his mother, sister and his father, Wade (Gary Poulter), a monstrous and abusive drunk whose idea of a hard day's work is smacking his son around and taking the kid's earnings for himself. Joe does what he can for Gary and a real friendship develops between the two but at a certain point, it becomes painfully evident that he can either ignore the boy's plight and watch him go down into the darkness that once consumed him or step in to save the kid, even at the cost of everything that he has struggled to achieve. 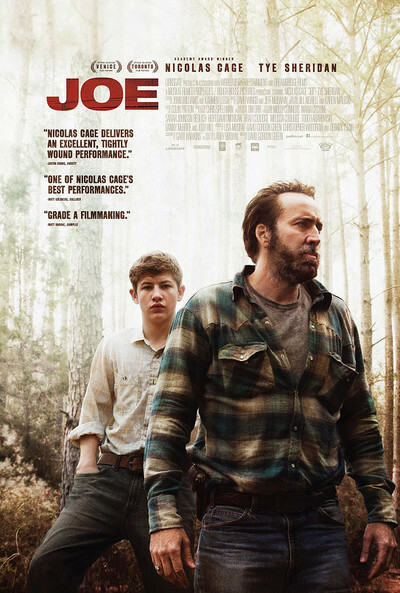 Based on the 1991 novel by Larry Brown, "Joe" was directed by David Gordon Green, and, like his star, his is a career that has also undergone a couple of inexplicable twists and turns. After making his debut with the extraordinary indie film "George Washington," he went on to make the equally compelling dramas "All the Real Girls," "Undertow" and "Snow Angels" before making his unexpected mainstream breakthrough with the decidedly different stoner comedy "Pineapple Express." That movie was pretty funny but he followed that up with "Your Highness," a fantasy spoof that is one of the biggest botches made by a recognizably great filmmaker of recent times, and "The Sitter," another misfired comedy whose main selling point is that it wasn't quite as unwatchable as its predecessor. Green returned to his low-budget roots last year with the amiable comedy-drama "Prince Avalanche" and with "Joe," he firmly reestablishes himself as one of the great American filmmakers of our time. With its rural setting and a narrative structure that is more interested in developing character and mood than it is in going from plot point to plot point, this material is right up Green's alley but rather than simply going through the familiar paces in the hopes of reestablishing his artistic credibility, he finds new ways to challenge himself as a storyteller. Although the basic plot, adapted for the screen by Gary Hawkins, may sound fairly familiar, he approaches it in a manner that is both shockingly intimate in its details and borderline mythic in terms of the emotional upheaval that the characters go through—you might have to go back to Charles Laughton's classic "The Night of the Hunter," another Southern Gothic masterpiece of note, to see anything like it. One of Green's great gifts as a filmmaker is his ability to create a real sense of mood and place throughout. With the aid of some excellent location scouting and the contributions of ace cinematographer Tim Orr (who has shot all of Green's previous features), "Joe" presents a world that will ring true to audiences at all points of the socio-economic spectrum—a place where friendship and loyalty are more than mere buzzwords even as the threat of unimaginable violence and brutality lurks around every corner, whether it comes from the bite from a venomous snake or a punch from an equally poisonous father—without ever coming across as forced or condescending. Green is a truly empathetic filmmaker and his ability to put audiences in the shoes of his characters has never been better than it is here. Cage is amazing here as Joe—fully divested of the quirky mannerisms that have dogged most of his performances of late, he has created a characterization that is as spare, lean and undeniably effective as anything he has ever done. Whether he is tapping into some extremely dark areas of Joe's psyche or slowly bonding with Gary, Cage is so fully immersed in the character that there is never a moment when we catch him acting—his movie star aura disappears and he simply becomes Joe. Whether this means that he is leaving the obvious junk behind to focus on smarter, smaller projects remains to be seen (and he does have the new film version of "Left Behind" on the horizon), his work here is the first evidence in a while that the actor that first knocked viewers out back in the day has resurfaced. The other stunning performance in the film comes from Gary Poulter as Gary's vile father, one of the most indelible depictions of pure evil that you will ever see. Not recognizing the name or his face, I looked him up after the screening and was stunned to discover that he was a homeless man who had never acted before (with the exception of Cage and Sheridan, the rest of the cast consists of non-professionals) that Green knew and cast in a role that would have challenged most "real" actors. Sadly, Poulter died shortly after the completion of this film, making it one of the great one-shot performances in the history of the cinema. Make no mistake, "Joe," although possessing a certain degree of welcome dark humor at certain points and a sense of ultimate redemption that feels earned for once, is a defiantly bleak work that contains moments of physical and emotional violence brutal enough to startle even the most hardened of moviegoers. For anyone simply looking for a light and breezy film to sort of watch while passing away a Saturday night, it might not be the best choice. However, if your moviegoing needs are driven less by a need to "feel good" afterwards and more by a desire to see something that will grab and touch you in ways that you will not be shaking anytime soon, this is the movie for you.